Danish Army Specific: The new Kegresse was supposed to act as support-vehicle for a section of armoured vehicles and performed well off-road. On-road the limited speed (32 km/h) made it unable to follow the section. It dind´nt perform very well on exercises in 1933 and 1934 due to a worn out engine, and a new was installed in 1935. 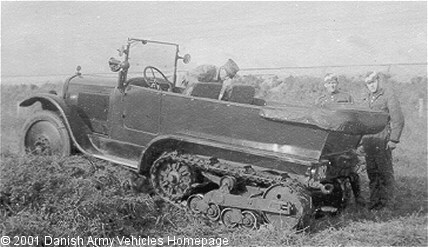 Historical: The vehicle had a boogie design, developed throughout the 1930´s, mainly for military vehicles. The new design differed from the original boogie by having the driving axle at the forward end, and equipped with sprockets. The new tracks featured metal cross-pieces and were of a sturdier design. The suspension too, was redesigned. A total of 5.795 Citroên-Kegresse was produced in the period 1920 - 1937. Width: 1.70 m (66 inches). Weight: 2.500 kg (5.500 lb. ).